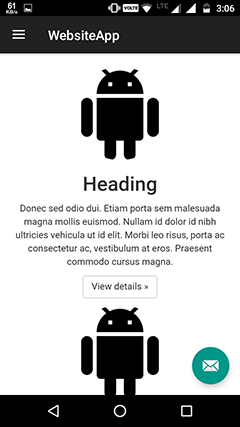 In this tutorial I will explain how to build a material design android app for website. There are many websites which does this in a click. But all of them lack material design and much options for customization. If you are ready to build it by yourself follow this tutorial. This is comparatively an easy method. I will be using the techniques I applied in the previous tutorials to build this one. This tutorial is a little bit long, so I will be explaining the most important steps. So lets start. 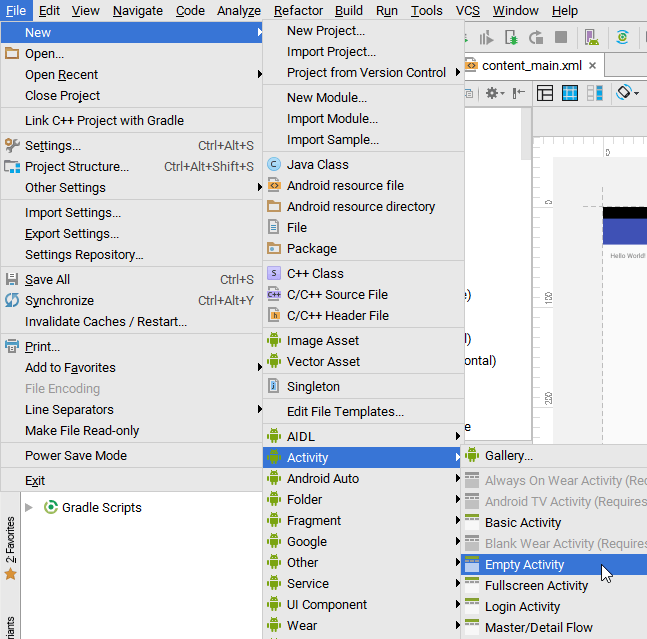 First open Android Studio and start a new project. I am giving the name as WebsiteApp. I am choosing the minimum SDK as API 14. 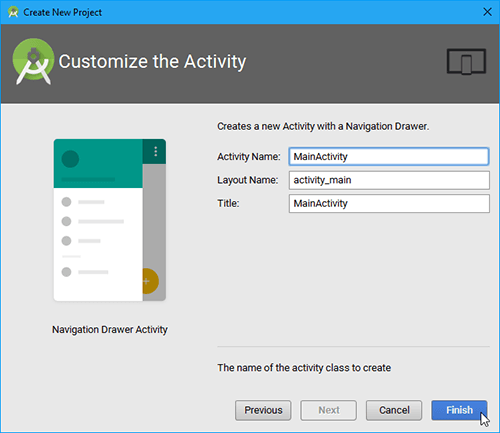 Here choose the Navigation Drawer Activity. Our app uses navigation drawer for showing different sections of the app. I am leaving the names as the default. Click finish. Now it will create the project. I am giving a dark colors to app. It is your choice. To get material design color codes use this link. To change color open colors.xml. There you can see three color codes. colorPrimary, colorPrimaryDark and colorAccent. I am setting the colors as follows. 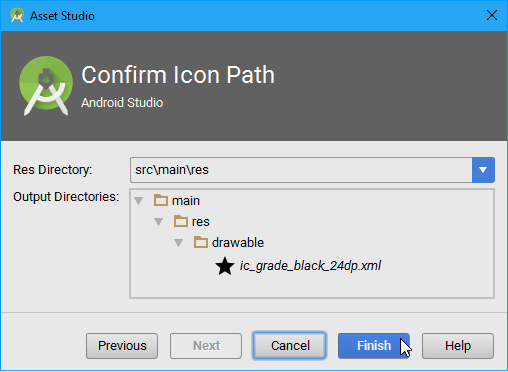 You can either use our own PNG icons or you can create a simple one using built in tool inside Android Studio. Here I am using built in tool to demonstrate it. Below is the icon I made using the tool. To create the same you can set the options in the following configuration. In next step click Finish. 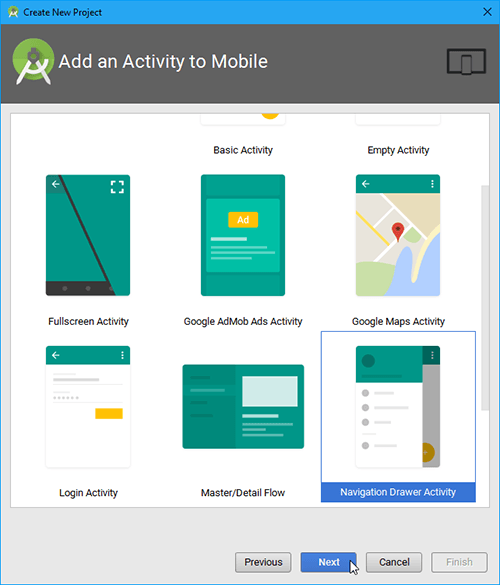 Many people implement Splash Screen as something user must see before moving to main activity. And they make user wait for nothing. But in my opinion Splash Screens must be something that should be shown to hide the loading process. So it should hide automatically when loading is completed. Here is how to implement this. 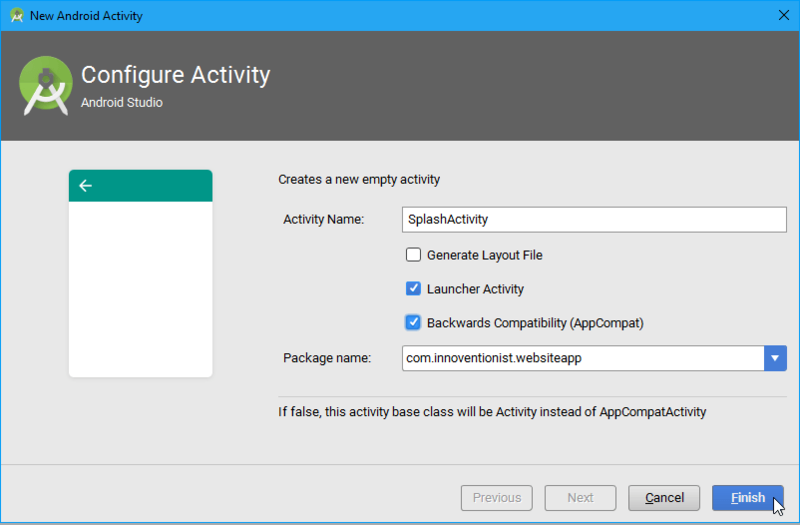 Change the name as SplashActivity. Uncheck Generate Layout File. 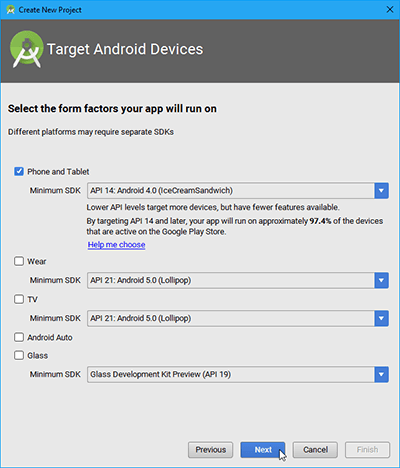 Select the Launcher Activity and Backward Compatibility. Here I will be using a background drawable instead of a layout for splash screen. 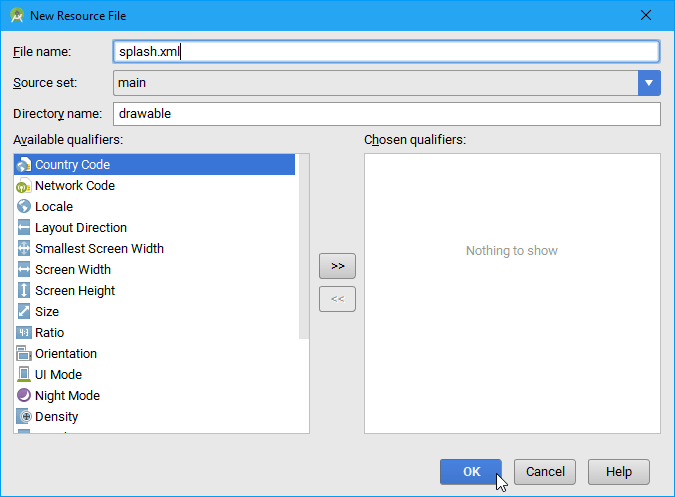 Give the name as splash.xml. Remove everything inside it and add following code to it. The first item sets a black background and next item shows the launcher icon we copied in the center. Now to set this drawable as the background for splash screen we use a custom style. So to create a style for splash screen open styles.xml and add following code to end of it. 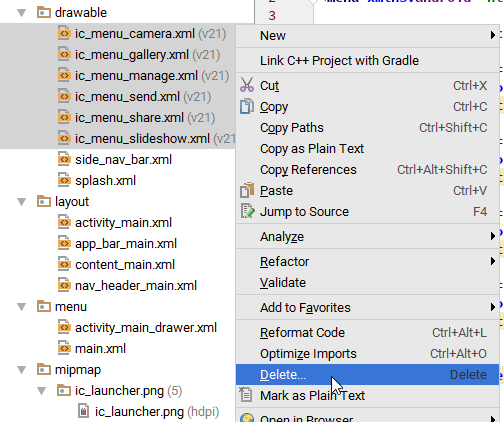 Now we need to edit AndroidManifest.xml. Open it and edit it like this. Intent filters of MainActivity is removed here and it is added to the SplashActivity. Custom theme is set using the theme property and label is given to it. Now lets edit the navigation drawer. First open res Â» drawable Â» side_nav_bar.xml. This is the background of the navigation drawer. By default it is set as a green gradient. I am changing this to our previously set variables. And I am removing the center color. 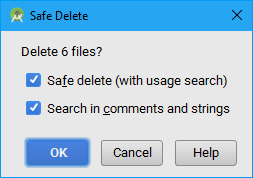 You can also remove the existing images by selecting them and deleting them from the right click menu. It will ask for the procedure of deletion. Just keep everything as default and click OK.
Now lets add menu items one by one. For each item we need an image. Luckily we have a bunch of material design icons built in to studio. 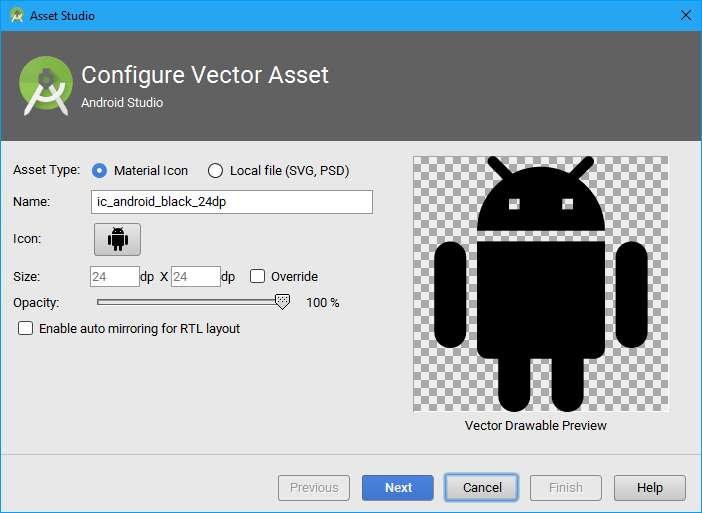 To add them right click on drawable then goto New Â» Vector Asset. I love Vector Assets because they are very small in size and can be resized to any dimensions without losing quality. In this window the option Material Icon should be selected. Then click on the Android symbol next to text Icon. Choose an image of your choice from the list. So we have the image. Now lets add the item to menu. For that come back to activity_main_drawer.xml and add new item like below. Now lets design our main activity layout. This is easy. We need only a WebView in our activity. To design it first open res Â» layout Â» content_main.xml. There will be a TextView for demo purpose. 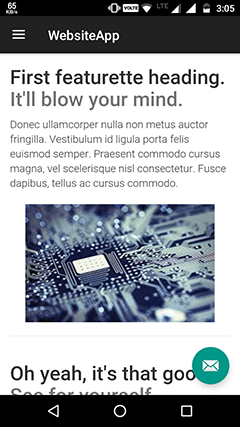 Remove it and add our WebView element. You have to make some HTML pages to show in the app. For demonstration I have made some. You can download it from here. You can easily make them from the website parts. 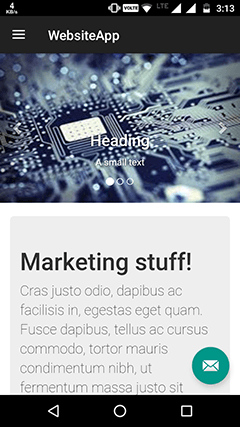 Here I used the example pages in bootstrap library. I removed unnecessary parts such as navigation bar, footer, menus etc. from HTML. I created 4 pages â€“ intro, products, services, clients. 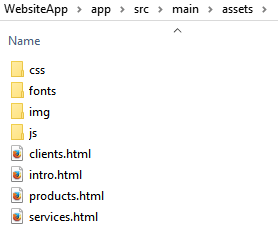 After creating them or extracting my zip file create a folder named assets inside app Â» src Â» main and copy all the files to it. We need to do some tweaks here. First define a web view variable just above onCreate. This is for accessing web view in everywhere inside the code. 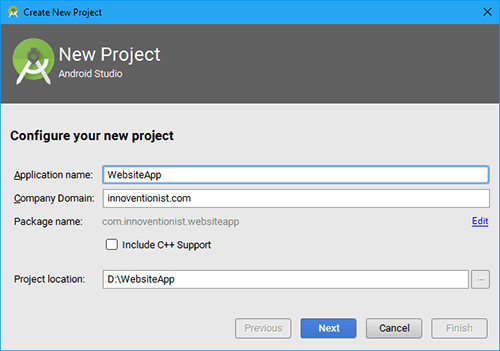 At the end of the onCreate function add following code to initialize WebView with our intro page of the website. For Intro, Products, Services and Clients we just load the respective html file to the WebView. 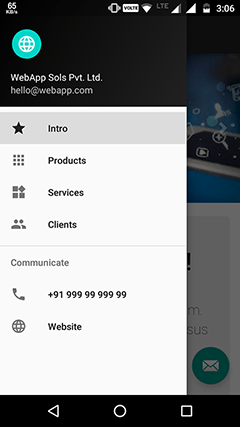 For call button we use an Intent to show the dialer with the phone number. And for the website link we use Intent to load the website link. Lets do some final touch up. There will be a settings menu at right top of the app. Since we are not using it here we can hide it. To do this goto onCreateOptionsMenu and comment by putting // infront the line that inflates the menu like below. Try modifying things. Try to run it in the emulator or in your phone. Any trouble? Comment below. Iâ€™ll help you.